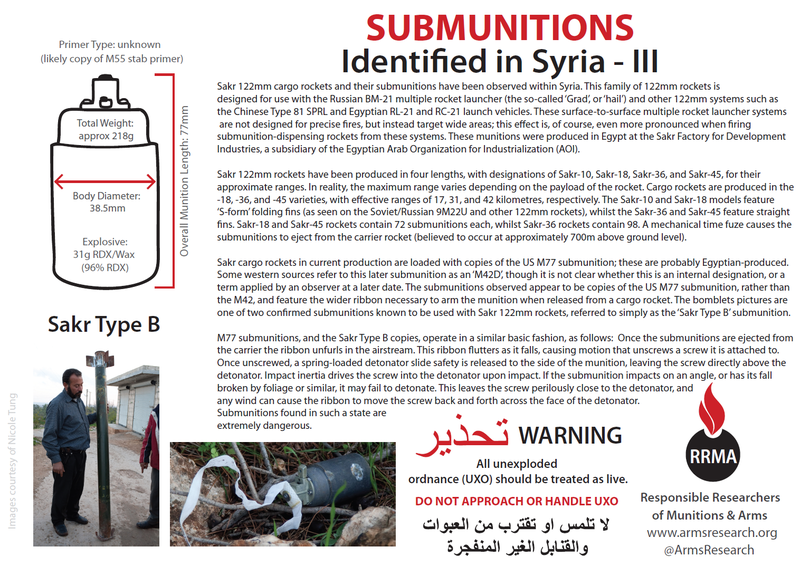 Following are two more safety sheets I produced for the RRMA, as part of a package provided to the United Nations Mine Action Service (UNMAS) to support their ongoing efforts in Syria. The content of these is drawn largely from previous posts here. 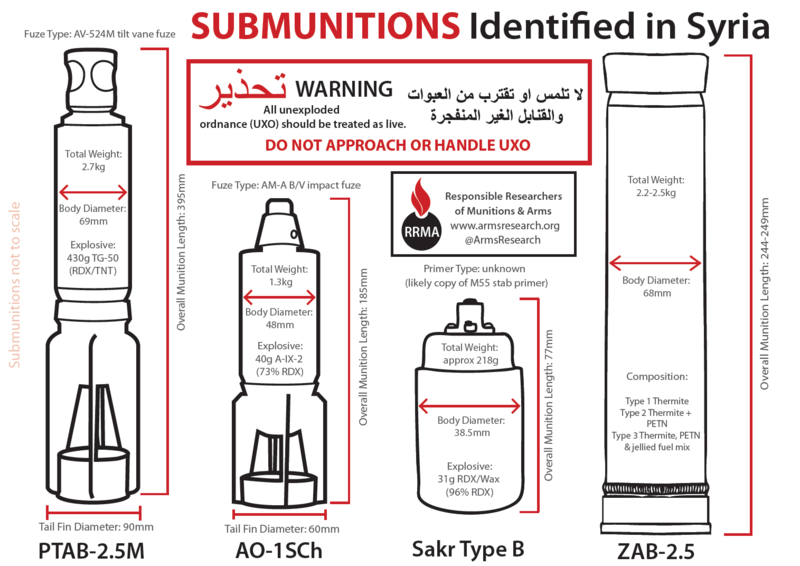 There are one-sheets for the ZAB-2.5 incendiary and Sakr Type B submunitions, as well as a general sheet (above) outlining the four different submunitions identified at the time of publication. 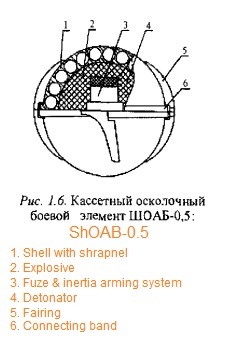 We have since observed the presence of ShOAB-0.5 submunitions as well, which I will discuss briefly below. ZAB-2.5 incendiary submunitions one-sheet, detailing the three variants and their respective compositions. Remember, attempting to extinguish these submunitions may be extremely hazardous. 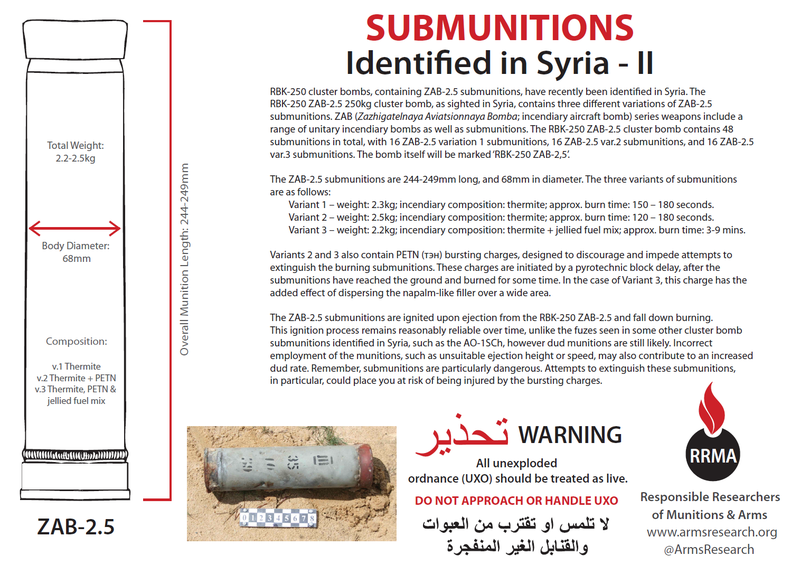 Sakr Type B submunitions one-sheet. Remember, these submunitions can be particularly dangerous due to their fuzing and detonation method. Even the wind can cause these type of munitions to detonate unexpectedly. ShOAB-0.5 submunitions have also been identified in Syria in recent weeks. 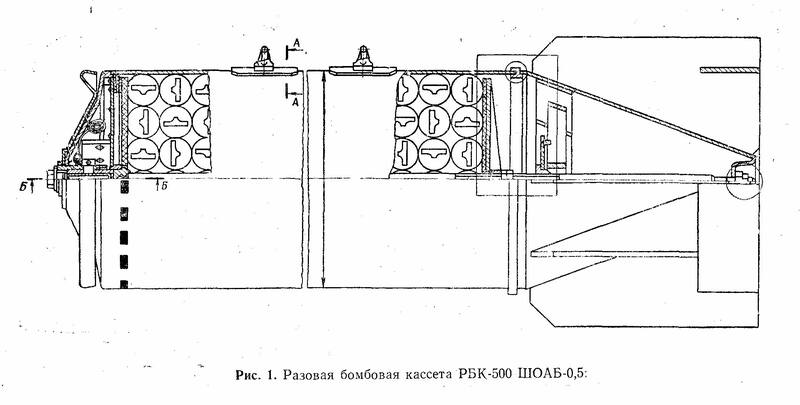 ‘ShOAB’ stands for Sharikovaya Oskolochnaya Aviatsionnaya Bomba, or ‘spherical fragmentation aircraft bomb’, and describes the fragmentation (anti-personnel) effect of these submunitions. The ShOAB-0.5 is loaded into the RBK-500 ShOAB-0.5 cargo bomb, which contains a nominal 565 submunitions (+/- 5 pieces). Assembled, these bombs are 1950mm long, and weigh 334kg. It should be noted that the diagram above shows a model without the aerodynamic fairing (nose cone). The bomb contains a central bursting charge for dispersing its payload. The ShOAB-0.5 bomblets themselves are derived from the US BLU-26 (and similar) series submunitions, and weigh approximately 417g each. They are 60mm diameter spheres containing approximately 304 steel balls which act as shrapnel when dispersed by the 70g of TG-30 explosive compound (30% TNT, 70% RDX) contained within the cast steel shell. Update 07/05/2013: Impartial Bias over at MP.net sent me the following video, showing several ShOAB-0.5 subs in Syria. My thanks to Michael Weber, Jeff Osborne, Alex Diehl, Yuri Lyamin, Eliot Higgins, and Damien Spleeters for their assistance with various parts of this post. Most interesting. I have linked to the Yalla Souriya blog: http://yallasouriya.wordpress.com/2013/04/19/this-video-was-posted-here-about-a-week/.